Script writers: Gutman I., Bezymenskiy L.
Operators: Dobronickiy V., Filatov I. The film is about Nuremberg process. The film was created by means of the photo and film documents. 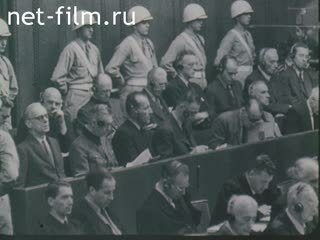 The film tells about the significance of the Nuremberg trials. The film was filming the following: the West Berlin Spandau prison building, where the imprisoned Nazi criminals. Living in West Berlin, gives an interview (synchronously), demonstration of neo-Nazis. Personnel news: statement G. Hess (synchronously) in the presence of A. Hitler, Hitler's troops parade in a stadium, A. Hitler welcomes young people in the stadium, the statement of children's orchestra, the people welcomed the A. Hitler. Kind of ruins of Nuremberg. Nazi criminals in the prison. The trial of Nazi war criminals in Nuremberg. Interview participant in the M.Yu. Raginskogo (synchronously). Personnel chronicles the Second World War: fighting the Nazis in the sea, of the Nazi storm troopers in Germany at the time of arrival of A. Hitler to power, the Nazi seizure of the Rhineland, annexation of Austria, Czechoslovakia, the attack on Poland, the meeting of the U.S. Congress in 1964, the American aggression in Vietnam. Second World War: Nazi parade in Paris, the attack on the Soviet Union - of the aircraft, tanks, infantry, shooting civilians, sending to Germany. Prisoners of a concentration camp after liberation by Allied troops. Israeli aggression in the Middle East. Demonstration of American neo-Nazis. The Second World War: the Warsaw Ghetto. Troupes in the streets of the ghetto. The fighting U.S. troops in Grenada. Second World War: the liberation by Soviet troops in Berlin. The presiding judge read out the sentence of Lord Lawrence. Street West Berlin - LS.,, MS., PNRM. Young people on the street - MS. Ruined Cathedral - MS., PNRM. Germany, the time on the tower. Spandau Prison - LS., PNRM. Says a resident of West Berlin (synchronous) - CU. They say a man and a woman (synchronously) - CU. The time on the tower - MS.
Interview men (synchronous) - CU. Woman says (synchronously) - CU. Ranks of the Nazis in the stadium. Hitler Youth in the stadium. Germany: Boys feet on tiptoe. Hitler travels by car through the stadium. The boy from the orchestra waving wand. Nazis at the stadium. .
People on the street during the Nazi Nuremberg Congress. Figures of saints in the cathedral. The time for the prison at Nuremberg. Nuremberg prison: the camera Streicher serve food. The time goes by cameras. Cell doors Doenitz, von Papen. The Palace of Justice in Nuremberg. The flags on the building. Watch ¬ Soviet soldiers at the entrance. People in the hall of the palace. Top of the Nuremberg trials. Tops F. Biddle, D. Parker (USA), Lawrence, Birket (UK) and others. 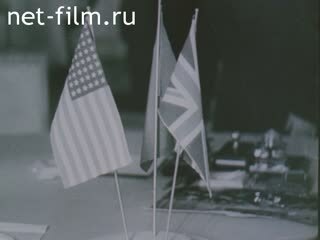 Four tables charges: U.S., UK, France, the Soviet Union. M. Raginsky - his assistant, listen and talk. Keitel, Jodl, Goering, Rosenberg sit. In the hall of cameramen, photographers. In the courtroom, the Soviet writers: L. Leonov, V. Ivanov, V. Vishnevsky. Hering welcomed the troops of the floor at the meeting, trying his sword. Hitler and Jodl at the map. Donitz greets military passes down sailors. Ribbentrop signed the document, his signature. He was a foreign diplomat. Among the military sits Hess. At the rally, advocates Streicher, Schirach. Sauckel talks with the military. Rosenberg sits sits in his office, goes to the military. Nyurbergsky process: G. Frank - the executioner of the Polish people, the ministers of the Reich: Frick, Funk, von Neurath, Speer. Kaltenbruner, Fritsche at the trial. Von Papen of influential people of Nazi Germany. Mines - Hitler's banker, talking to a woman. Nuremberg: the process Rosenberg, Goering, Keitel, Sauckel, von Papen, Schacht. Playing Jackson, J. Shawcross (England), Menton (France). Courtroom with the top point. The street is a detachment of stormtroopers. The statesmen of the building. Parade at the Brandenburg Gate. On the balcony of the house with the children Hindenburg. Election campaign: people with portraits of Hitler. Hitler speaks at a rally out of the building. In the fire throws the book. Messerschmitt at the rally (rising from his seat). Porsche and others at the banners. German soldiers traveling by car, deploy gun. German troops passing over the bridge. German troops in the city. Meeting Hitler in an area of ​​Vienna. Chamberlain, Daladier, on the airfield. They and Hitler before signing an agreement on the division of Czechoslovakia. Chamberlain out of the plane, speaks and shows the document - agreement. German soldiers are raising shlakbaum in Czechoslovakia, horse rides. Hitler is on the area of ​​the Czech city. September 1 attack on Poland. German ship fires on the Polish coast. Hitler and his associates on the terrace of the villa. The judges at the table. Hitler came to a meeting of the Reichstag. Fascists greet him, rises to the podium, speaks about. Poland: shoots a German ship, the gun ship. The ruins of the smoke, the cross. Meeting of the U.S. Congress. 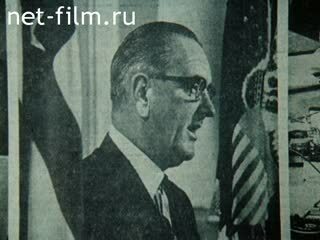 On the podium, President Johnson. The White House in the evening. Destroyer "Maddox" in the Gulf of Tonkin. With a U.S. aircraft carrier aircraft takes off. Soldiers held a knife to her throat Vietnamese, beats him. Mistreatment of Vietnamese, tied to a pole arms, fighting with a woman. At the trial of the U.S. serves Jackson. The Germans come to the territory of the USSR. Soldiers are running in the woods riding tanks. Germans are cutting the fence. USSR. Burning village, is a German soldier. A woman with a child in her arms, fleeing residents. Woman sitting on the ruins. A column of people taken to Germany. Listening on the process - MS.
Acts Colonel Pokrovsky (synchronously) - MS.
At the trial judge at the table. The court room at the top. 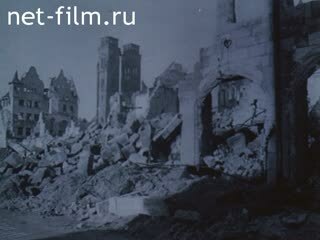 Document - the accusation, cameramen CSDF who withdrew Nazi atrocities in the USSR. Human corpses at the wall. Disfigured corpses of the Red Army. Human corpses in the snow, charred leg, deification corpses in the room. In a remote wasteland human corpses in the snow. The corpses of father and daughter connected hands. From the basement take out corpse of a woman with a child. Boy crying in his mother's corpse. The people at the pit with corpses. Are prisoners of concentration camps behind barbed wire. It should be a prisoner. Open the oven door crematorium. 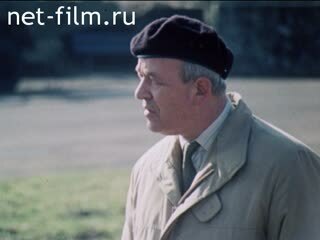 Says R. Korneev, a former prisoner of the camp "Dora" (synchronous) - CU. Lie dead on the ground. Skim with photo Nazis who worked in the "Dora" - CU. Rudolph Brown - photos, CU. Plane at the airport - LS. The ramp down D. McCloy, greets welcomers - MS., CU. Greeters at the plane - CU. Passport in the name K. Altman - CU., PNRM. Police cars driven by Barbier in jail - CU. Newspaper with photo Mengele - CU. House, where he lives Maykovskis - MS.
Street of the city - LS. People come into the store - MS.
American neo-Nazis go - LS. Neo shows boxing techniques - CU. Go neo systems - MS.
Neo-Nazi leader shouts (simultaneously in English) - CU. Neo-Nazi and son - MS.
Neo-Nazi with a boy - MS.
Plea boy neo-Nazi (simultaneously in English) - CU. The boy in the orchestra. Neo-Nazi demonstration in the United States - MS.
Neo-Nazi leader shouts - CU. Neo-Nazis with flags - CU. On the podium Soviet prosecutor LN Smirnov. Buckets and soap, bars of soap. Samples of human skin with pictures, head to the stands. Dead bodies lay on the cart, driven. Brought to the barn shift. Pass the elderly, children along the wagons. Fascists run down the street. Runs into the doorway, herding the people on the street. Is a crowd of people - LS. Israeli soldiers jump out of the truck and ran down the street - LS. Are wounded on stretchers - MS. Crying woman in the crowd - MS. Killed in the street - LS., MS.
PNRM. with faces disfigured child killed by a hand - CU. Mangled cars on the street - LS. Murdered girl - CU., PNRM. Waving the American flag on the mast carrier - MS.
Aircraft carrier - filmed from a helicopter - LS. Takeoff from aboard an aircraft carrier - MS.
PNRM. associated with people of Grenada for mercenaries with machine guns - MS.
Go mercenaries with weapons - LS., MS. The face of a mercenary in the helmet - CU. German troops go on the road. Pass by the pit with the dead. Brandenburg gate of fire and debris. Soviet tanks in the streets of Berlin. Soviet soldiers with a banner on the roof of the Reichstag. Cheering crowd in Red Square. Thrown in the air rights. Joyful woman with British flag. Cheering crowd with an American flag. Arc de Triomphe in Paris, decorated with flags. De Gaulle is among lyukuyuschy people. USA. Ezenhauer drives a car of cheering crowds. Photo by B. Jones - MS.
Says B. Jones (simultaneously in English) - MS., CU. Says B. Jones (synchronously) - CU. Secret document to plan the bombing of Soviet cities - MS.
PNRM. on the list of Soviet cities - MS.
Says B. Jones (synchronously) - MS.
April 25, a meeting of Soviet and American troops on the Elbe. PNRM. on the monument at the Elbe - MS.
PNRM. the monuments, tanks - LS. Sculpture in Volgograd "Motherland" - MS.
Bell in Khatyn - MS.
Sculpture of an old man with a child in Khatyn - MS.
Sculpture of a woman - MS.
Sculpture of a wounded warrior - LS. The monument at the former concentration camp "Ravensbruk" - MS.
Sculptural group on the mountain - LS. Sculpture of a woman on Piskarevsky - MS., LS. PNRM. with the colors of the sculpture wounded warrior - CU. The judges' table in an empty room, a table with documents.